Concentrating solar power (CSP) is thermal solar power that uses a means of magnifying or concentrating the effective radiation from the sun onto a receiving device that collects the power so that it can be used directly as thermal energy or used to generate electricity. It is generally economical in sizes of 10 MW and larger, from community sized systems up through major grid connected systems. CSP is the most developed of the solar technologies and is on the verge of being competitive with conventional power plants. CSP technologies relatively low cost and ability to deliver power during periods of peak demand mean that it has the potential to be a major contributor to our electrical power needs. 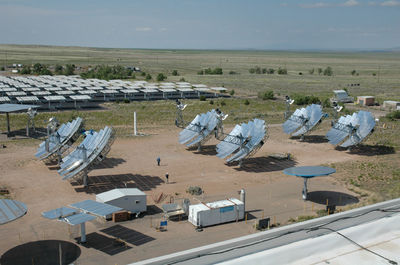 The solar resource for generating power from concentrating solar power systems is plentiful. For instance, enough electric power for the entire country could be generated by covering about 9 percent of Nevada—a plot of land 100 miles on a side—with parabolic trough systems. It is not too much of a stretch to foresee that future power needs for much of the southwest; Arizona, California, Nevada, New Mexico and Texas could be met with concentrating solar power. Electrical Costs from CSP facilities is coming down at a reasonable price. All of the technologies forecast that their costs could be less than $3.00 per watt by 2015. This corresponds to a cost of $0.10-$0.15 per kWh. Some current incentives reduce the costs to the point that costs are competitive with conventional power plants. Currently solar toughs are believed to be the lowest cost, with some large projects being initiated. Solar dish costs have not been publicized, but must be on the same order as solar troughs or recent orders for large systems would not have been made. These orders, when completed, will enable solar dishes to overtake solar troughs as having the largest installed capacity of all grid connected solar systems. A 10-15 MW solar tower is under development in Spain. 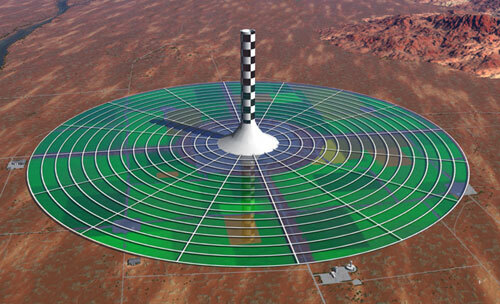 Twenty five MW to 200 MW solar chimney projects are under development in Australia and the US. 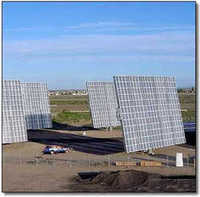 I am not aware of any actual large orders for concentrating solar photovoltaics, plants of up to 100 kW have been built. Amonix claims that their costs for concentrating solar photovoltaic are approaching competitive values. 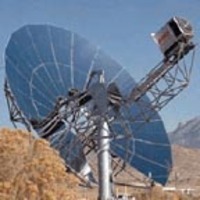 Dish/Engine Systems - The "dish", sometimes referred to as a concentrator, is a large, mirror covered dish shaped structure which collects the solar energy and focuses it on a receiver/engine suspended above the dish. The structure is rotated on both the horizontal and vertical axis to track the sun continuously. The receiver/engine absorbs the solar energy and heats a gas which is used to drive an engine/generator that produces the electricity. The most common form of heat engine is a Stirling engine. Solar Troughs - Sunlight is concentrated by parabolically curved, trough- shaped reflectors onto a receiver pipe running through the focus of the curved surface. This energy heats oil flowing through the pipe, and the hot oil is used to generate electricity using a conventional steam generator. The troughs are rotated, up and down, about their horizontal axis to track the sun for maximum efficiency. Solar Towers - A large field of sun-tracking mirrors (heliostats) reflect solar energy and focus it onto a receiver at the top of a tower. A heat transfer fluid is heated in the receiver and used to generate steam which is used in a conventional turbine-generator to produce electricity. Solar Chimney Systems (or power towers) do not use mirrors or reflectors, but may be confused with solar towers because of their appearance and are usually discussed together with solar towers. In solar chimney systems heat is collected in a large glazed solar collector containing thermal storage media. Ambient air, drawn in from the outer edge of the collector, is heated as it flows over the thermal storage media and then, by convention, it flows up through a very tall chimney. Wind turbines in the chimney, driven by the air flow, drive generators producing electricity. 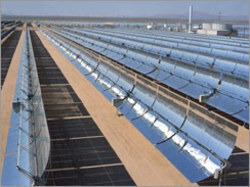 Concentrating Solar Photovoltaics - Flat plastic fresnel lens, between the sun and a photovoltaic cell, focus and concentrate the sunlight many times (up to 500 times) onto a small cell area thus reducing the cell area required to an amount approximately equal to the concentration ratio. Small quantities of very efficient, expensive, multijunction cells are use to convert the sunlight into electricity. Two axis tracking is required to maintain maximum efficiency. Two suppliers, Sunball and Sunflower are developing smaller modules of this type for individual dwellings, apartments or small industrial applications. In the Overview of Concentrating Solar Power there is no mention of linear fresnel concentration. why? It wasn't a major point, but in the item about concentrating solar photovoltaics it was mentioned in the first sentenance. The primary use of fresnel lens is with photovoltaics as far as I know. I did not go into an explanation of how they work or their low cost as I thought this should be handled in a more detailed post. Please let me know if I have overlooked sometning. I find that many people are missing the point and are not aware of the pending energy/oil shortage. The world population is increasing; many countries are advancing to the current technology. Fossil fuel/energy is being depleted faster than it’s been regenerated. It is time for the energy revolution. That means other sources of energy such as: Solar/Photovoltaic, Wind, Geothermal, Hydrogen, Wave/Tidal, Nuclear/Fusion and numerous other sources, not to mention efficiency and conservation. (The use of lake/Ocean water for cooling). It is time to set the mindset of the people, industry and the government on a crusade to develop and utilize alternative energy on a massive scale. It will take many decades to reach those goals. But we need a total commitment of funds, research and implementation to reach those goals or we are doomed. The United States the most economically advanced country in the world must become energy independent, for our sake, our children’s sake and future generations. I have a different type of concentrating system. It uses one Fresnel lens to seperate the spectrum and concentrate concentrate it. This allows specific concetrator solar cells to recieve the wavelengths where they are most effecient. Don Wagner, good luck with your approach. So you will use some sort of lateral architecture, like this? Yes it is. The solar cells are essentially the same as the ones mentioned in the paper. The difference is in the optics. They use dichroic mirrors (very expensive) versus a cheap Fresnel Lens. You can see how it works by looking at http://www.sol-solution.net/Animation.html or can check out patent 7206142. Which copanies commericially cell dish-stirling systems? I am very interested in fresnel technology. Could you say to me if there are any texts to consult?Or if you could say to me where I can find informations about this technology. Thank you very much! I have designed a modified aluminum frame louvers to hold and focus flat mirrors individually as in the Fresnel reflector system. I also have two engineers working on a design for a solar tracker that should prove much more economical than the present solar tracking equipment being manufactured. We hope to produce the trackers and offer them to companies wishing to manufacture solar concentrating equipment. If there is anyone interested in the special louver design, please write to me and I will send over the engineering specs for factory production. Thus far, I have received quotes of about USD 7 to 7.50 for a pair (left and right) which hold 5 slats of mirrors. There is a place for a set screw for each to be set at a specific angle. It is designed for flat mirror glass of 4-5mm thickness and lengths up to about 1 meter. I may also design a center mirror support clip to be used so that glass mirrors of perhaps 2 meters may also be used. Supports are necessary to reduce stress on the mirrors and to retard wind breakage. how can I decrease the temperature caused by the UV using the concentrator and a regular PV panel? I overview the Solar Power Generator and I think this alternative energy will be the answer in global crisis of lack of electricity. I think this post gives me lots of information about solar power. I'm working on a green house project. I'm really interested by this Hybrid Bus and I really would like to know if it's reliable for single housing application. I'm working on a green house project. I'm really interested by this Solar power and I really would like to know if it's reliable for single housing application. CSP: a good news for Developig countries in the tropics. The products, unlike conventional glass-based PV products, are lightweight, flexible and rugged and can be aesthetically integrated into buildings. This is interesting, it is good to see that people are trying to advance the solar technologies. Yeah, you're right! The upraising technologies now are being so out most and neutral for being known in today's world. Concentrated solar power mainly uses glasses and lenses to collect the solar energy and transfer in to heat. The big generators can be drives easily with the use of this heat engine.